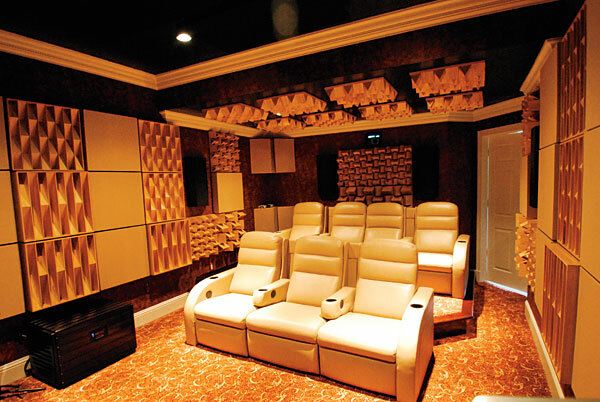 There are multiple acoustic issues to deal with when creating a home theater. One is noise reduction. Sound proofing your home theater so that adjoing rooms to interfere with the internal acoustic qualities, as well as containing the sound within the home theater room to minimize noise pollution into adjoing rooms and even your neighbor’s ear range. All Noise Control barrel shaped diffusers are ideal for wall and ceiling applications in band, choral and music facilities requiring acoustical performance. They are lightweight and a simple, quick installation. The acoustic quality of a room can be greatly enhanced with a combination of Acoustical Wall Panels and our Barrel Shaped Diffusers. The Noise Control Barrel Diffuser is constructed of high reinforced rigid E-glass fiberglass molded into a single piece “barrel” shapeThese diffusers are finely tuned to reflect sound. Standard finish is white gel-coat or optional fabric wrap. Standard sizes range from nominal 2’ X 2’ to 4’ X 8’ with custom sizes available. Noise Control is proud to offer yet another aesthetically pleasing noise control solution. Our “Binary Array” – Art Diffusor is suitable for use in recording, broadcast, theater, home listening rooms, offices or anywhere diffusion is required and will add to the architectural & aesthtic interest of the room. The Model C-WM is a wall-mounted diffusor that can be easily installed using construction adhesive. The Model C-CM is a diffusor designed to fit into your ceiling exactly the same as a regular ceiling panel. The Model C-DL is a diffusor that installs the same as the CM, but allows you space within the diffusor to provide for lighting or sprinklers. Barrel shaped diffusers are ideal for wall and ceiling applications in home theaters as well as band, orchestra, choral and music facilities requiring acoustical performance. They are lightweight and a simple, quick installation. A Molded in a one-piece offset inverted pyramidal shape which reduces flutter echo and eliminates floor to ceiling standing waves. The primary purpose of a Sound Diffusersl is to scatter the reflected sound into many directions, thus enhancing the sound diffusion within the room. Good diffusion leads to high-quality sound throughout the room. Ceiling Sound Pyramid Diffusers are perfect for applications that require a high degree of sound diffusion, such as music rooms, band rooms, and concert halls. They are lightweight and easy to install in a standard ceiling grid or can be installed on walls with a 2 part clip system. Molded in a one-piece offset inverted pyramidal shape. Internal cavity can be lined with 1-1/2″ thick absorber layer of glass fiber batts.